For the first time, scientists have found lifeforms where nobody thought it was possible: floating in the troposphere, the slice of the atmosphere approximately four to six miles (eight to 15 kilometers) above Earth's surface. And not just a tiny few, but lot: 20% of every particle in that atmospheric layer are living organisms. This has profound implications for our understanding of weather, the spread of disease, and life on other planets. We did not expect to find so many microorganisms in the troposphere, which is considered a difficult environment for life. 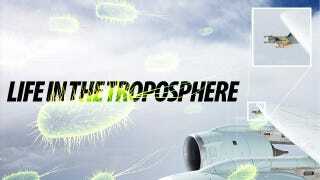 There seems to be quite a diversity of species, but not all bacteria make it into the upper troposphere. The organisms were captured on board a NASA DC-8 aircraft equipped with a special probe (highlighted on the image above) as part of their Genesis and Rapid Intensification Processes mission, a program is designed "to study low- and high-altitude air masses associated with tropical storms." They obtained the samples before, during and after two major tropical hurricanes in 2010: Earl and Karl. Once the particles were captured in the instrument's filters, scientists analyzed them using genomic techniques. These included polymerase chain reaction (PCR) and gene sequencing. These, according to the study, allowed them "to detect the microorganisms and estimate their quantities without using conventional cell-culture techniques." They discovered living bacteria cells "in the size range of 0.25 to 1 microns in diameter" and some fungi. Depending on where the air masses came from, the bacteria was of marine or terrestrial origin. In the absence of dust or other materials that could provide a good nucleus for ice formation, just having a small number of these microorganisms around could facilitate the formation of ice at these altitudes and attract surrounding moisture. If they are the right size for forming ice, they could affect the clouds around them. The hurricanes may in turn play a vital role in the spread of these micro-organisms, moving vast amounts of bacteria over very long distances. Scientists believe that these bacteria and fungi may feed on the carbon compounds found floating in the air, but they are not sure yet. Konstantinidis says that "for these organisms, perhaps, the conditions may not be that harsh. I wouldn't be surprised if there is active life and growth in clouds, but this is something we cannot say for sure now." Does this mean that there may be other bacteria floating in the atmosphere of other planets? Perhaps. If they can make it here, there's no reason to think that it's not happening elsewhere. Yet another place to look for life.